Popular for home use, our best selling gift item comes imported from France. 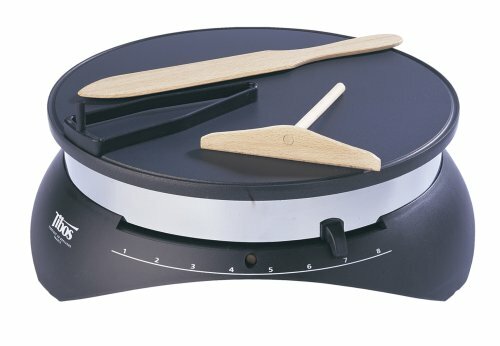 Have fun making crepes at home with the Krampouz 13 inch diameter teflon griddle. Following simple instructions and recipes provided, you will be able to use the patented spreader device to make crepes with ease. Includes ladle, rake, spatula, recipe booklet full of unique French recipes, brush and patented spreader device. 110 Volts. One year parts and labor warranty. Made in France by Krampouz. The original manufacturer of precision crepe makers since 1949. Ordered this as a gift for my BF. He has made some excellent crepes with this. It has changed breakfast in our house for sure. He has even taken in to his work and made crepes for the people he works with. Really a great crepe maker for the money! Thank you for this great new gadget!! !